I had, in 2005, what I thought was my Year of Fire. I got divorced; moved from the house my ex-husband and I owned back into my parents home and then into my grandfather’s house; and then sold most of my things, hopped into my little blue first-gen Prius, and shot off to Los Angeles to begin law school and a new life. It was a transition of body, mind, and spirit: a rebirth. I can feel the same thing occurring right now, as if God were a blacksmith, and that Year of Fire had simply warmed my metal spirit for these years of reshaping, and 2011 was another trip through the smoldering ashes. It was the year that I had to face every dark thing that ever happened to me that I had ever hidden from myself. It was the year I shamefully punched my husband in broad daylight for trying to hold me to the sidewalk as I stormed into traffic trying to end my life because I believed, erroneously, that I was what was wrong with the world. It was the year the police took me to the hospital for my own protection, and the year that I finally understood why killing yourself is a crime against society. 2011 was the year that I realized that the only person truly holding me back from anything, even happiness, is me, and that, while it seems sad to me right now, it’s really a very happy thing… because for all the lack of control I have over impediments to my goals, my attitude is the one thing I can control. Thus, impediments can be overcome or worked around. Almost nothing in this world is impossible. So when I say 2012 is going to be better than 2011, I can say it with confidence, because I have nowhere to go but up from here. In 2012, I will not be losing my home, like I did in 2011, to move in with family, but living happily with family and hopefully moving out into our own place again. In 2012, I will not be cutting my parents out of my life and suffering their loss because of deep, long-held misunderstandings, but rebuilding deep and meaningful connections with them based on love and trust. In 2012, I will not be seeking to help the world by getting rid of one more problem person, but rather helping the world by giving myself compassion and spreading love and compassion to others. If I can face multiple sclerosis and seizure disorder every day, I can face the opinions of an audience. So… What’s holding you back? I am fortunate to be part of a group on Facebook for people in their 20s and 30s who have MS. On there, we discuss living with the condition: our ups and downs, and we help one another cope. Recently, one of the members was talking about how hard it is to have our condition and to be surrounded by healthy family members who do not understand the levels of pain that we often reach, and sometimes are constantly mired in. Empathy can only go so far when you’re not living in someone’s body. I know that no one knows exactly what I feel because no one is experiencing my physical feelings but me. Neuropathic pain can be as simple, mild, irritating and annoying as that pins and needles feeling that you get when you’ve let a part of your body fall asleep, or it can be as heinous, torturous, and world-shattering as child-birth (or so I’ve heard). At its worst for me, it’s felt like a broken bone where nothing is broken. And that’s the beauty of MS: it’s different all the time, for everyone. It just depends what neuron that demon disease has decided to chomp on at the moment. That’s also one of the hardest things for those of us with MS, because we cannot anticipate where or when the pain is going to come. We just know that it will eventually show up. This post is not about the wonders of weed. It’s a band-aid on a gaping wound for what I’m talking about right now. A bucket of water on a raging fire. Right now, I want to talk about the space between pain and suffering, which actually can exist, and which widens with increased meditation practice. Pain is going to hurt, no matter what, but you don’t have to suffer with thinking about how badly you feel. When you know what is causing the pain, you can acknowledge it and move on with your day (sometimes). Being able to separate the physical cause of emotional distress from your emotional state allows you to be more friendly and compassionate to everyone around you, and makes you a happier person overall. Now, I’m not pushing any religious agenda here – just an activated mind-body connection. Heck, even researchers in Switzerland have shown that mindfulness meditation help those of us with multiple sclerosis with depression, fatigue and anxiety. There is even research documenting the positive effects of meditation for those of us with MS dating as far back as 2003 at the Multiple Sclerosis Resource Centre. Meditation is really just as simple as sitting in a comfortable position, hands clasped, and focusing only on your breath for 20 minutes. You don’t need to do anything specific besides focus on your breath and clear your mind. For those who would prefer to clear your mind while listening to a guided meditation for pain, here’s a good one. Well, I don’t know about all of you, but one of the things that was hardest for me to go give up when I started down the Paleo path was fast food. I was shocked to realize how often my husband and I stopped at either McDonalds, Wendy’s, or some other drive through simply because we hadn’t given ourselves adequate time to shop for food, cook, and to do dishes and clean up after ourselves. Nowadays, we look to the number of steps it takes and number of dishes involved in any recipe in determining its worth to us. Certain tools in our kitchen are valuable players, like our slow cooker, wok, and food processor. What ends up feeling like “fast food” to us now that we’re on the Paleo Diet is stuff that is ready when we’re hungry! Things like fruit, salads, Crock Pot meals or leftovers. Spaghetti Squash became a favorite for just that reason! Did you know you can cook half a spaghetti squash (1 serving) in the microwave in under 7 minutes? As I considered what food cooks quickly or what food we move to heat quickly, the other day, a thought occurred to me. There are no truly healthy fast food restaurants out there. And there’s no good reason for that. I’ve been thinking a lot about opening a Paleo fast food restaurant. I think it would be very cool to make a splash in the fast food industry, but I’ve watched enough Gordon Ramsay shows to know it’s not easy, so a business plan is underway of being written. When 9 out of 10 restaurants close in the first year, you have to be willing to chart out all of your numbers first before you go out there and try to find people to work with you. Otherwise, you’re just a pretty face with a dream and a bunch of recipes who’s looking for a bad time. Besides, writing it out will give me something to do. Merry Christmas to all who are celebrating, and happy weekend to those who aren’t! Also, happy 5th night of Hanukkah to all my fellow Heebs. I’ll be off to the in-laws for mass consumption of very NON-paleo-friendly foods and extremely good company. Whatever aches and crankies I get from eating, I will more than make up for in merriment this evening. I hope from the bottom of my heart that everyone who is reading this is doing well, has friends and family in their lives who love them well, and that you are somewhere safe. May peace, friendship, compassion, and caring guide you and protect you throughout the new year, and may happiness be your constant companion. in the December 2011 issue of The Quarterly Review of Biology, Dr. Angelique Corthals, a forensic anthropologist and professor at the John Jay College of Criminal Justice in New York, suggests that MS is not an auto-immune disorder, but rather that it is caused by faulty lipid metabolism. Dr. Corthals article asserts that the basic cause of MS can be brought back to transcription factors in cell nuclei that control the uptake, breakdown, and release of lipids (fats and similar compounds) throughout the body. 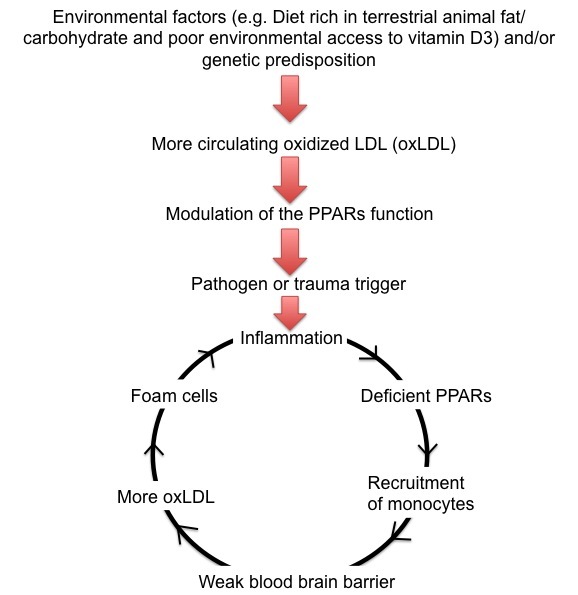 Disruption of peroxisome proliferator-activated receptors (PPARs), causes a toxic byproduct of “bad” cholesterol called oxidized LDL to form plaques on the affected tissue. The accumulation of plaque in turn triggers an immune response, which ultimately leads to scarring. This is essentially the same mechanism involved in atherosclerosis, in which PPAR failure causes plaque accumulation, immune response, and scarring in coronary arteries. A major risk factor for disruption of lipid homeostasis is having high LDL cholesterol. So if PPARs are at the root of MS, it would explain why cases of the disease have been on the rise in recent decades. “In general people around the world are increasing their intake of sugars and animal fats, which often leads to high LDL cholesterol,” Corthals said. “So we would expect to see higher rates of disease related to lipid metabolism—like heart disease and, in this case, MS.” This also explains why statin drugs, which are used to treat high cholesterol, have shown promise as an MS treatment. The lipid hypothesis also sheds light on the link between MS and vitamin D deficiency. Vitamin D helps to lower LDL cholesterol, so it makes sense that a lack of vitamin D increases the likelihood of the disease—especially in the context of a diet high in fats and carbohydrates. This weirds me out a little as I had high cholesterol as a child but not as an adult. I know I’m not everyone. Dr. Corthals’s framework also explains why women are more apt to get multiple sclerosis than men. It has to do with how our bodies metabolize lipids. Men metabolize them in their vascular tissue, while women’s bodies are more likely to metabolize it differently. There are several other risk factors for reduced PPAR function: pathogens like Epstein-Barr virus, trauma that requires massive cell repair, and certain genetic profiles. In many cases, Corthals says, having just one of these risk factors isn’t enough to trigger a collapse of lipid metabolism. But more than one risk factor could cause problems. “In the context of autoimmunity, the various risk factors for MS are frustratingly incoherent, but in the context of lipid metabolism, they make perfect sense.” Dr. Corthals said. Research is necessary to fully understand the role of PPARs in MS, but we all hope that this new understanding of the disease could eventually lead to new treatments and prevention measures, and maybe even a cure. In any event, as the scientific community known as “they” go on and study this hypothesis, I’ll be sticking to the Paleo Diet to bring down my inflammation by staying away from dairy, grains, and legumes, lower my LDL cholesterol levels by sticking with lean meats and lots of fresh veggies, and keep up my Vitamin D levels with fresh whole food, time outside, and supplements. We might not yet have a cure, but we certainly have ways to help ourselves in the meantime. Tao Thursday? :-P Not quite. I had intended to translate another chapter of the Tao de Ching for you today, but I just don’t have it in me today. I’m not sure if I have a pseudoexacerbation or an exacerbation going on, but I certainly feel like crap. Both feet are numb and have the pins and needles feeling going on, and I have had a few seizures today. That being said, I’m going to go back to laying down and being less perky. At least we’re more than halfway out of the dark. I love December 20th. It’s the day before my birthday, which means that it’s officially, the longest day of the year. What’s that you say? June 21st, the summer solstice, the direct opposite of my birthday, the winter solstice, is actually the longest day of the year? I’m sorry, but you are mistaken. This year, however, fate has taken pity on my inner child and has given her a beautiful distraction! The first night of Chanukkah! I tell you, I love Decemberween. I was worried a bit when Adam and I started dating since he was Catholic, and I was Jewish that we would have a hard time at the holidays, but since we just celebrate everything, we have a really good time. I hope we can find a dreidel while we’re out. The fact that Adam has played D&D and other dice-based games his whole life and never played a game of dreidel is a shame that must be fixed. I hope everyone has a great 1st night, filled with latkes and gelt!